Residents of a Los Angeles-area motel leaped from their second-story rooms early Thursday as a fire ripped through the building. One man died in the blaze and at least 15 others were injured. The Los Angeles Fire Department said the fire erupted at around 3:15 am local time on Thursday, local news network KLTA-TVreported, at the Wilmington Motel around 20 miles south of downtown LA. Over 100 firefighters from a total of 16 companies, five command teams and paramedic rescue units responded and battled to control the blaze as it tore through the 20-unit motor lodge. Emergency personnel spent about an hour fighting the blaze, according to the Associated Press, and said that the lone casualty was a man found inside the motel. Authorities had not released the man’s name as of late Thursday morning, but the AP identified him as a resident of the motel’s first floor who died at the scene. A resident of the motel, Paul Gordon, told a local NBC News affiliate that he was woken early on Thursday morning by smoke alarms and immediately discovered the fire. "I opened the door to see what was going on and flames just rushed into my room," he said, "I was able to close the door to keep the flames out, but the smoke was getting lower and lower. The only thing I could do was... grab my phone and jump out of the windows,” he said. More than a dozen others were injured, including two children. A local ABC News affiliate claimed that one of the kids was reportedly tossed from a second-story window and caught safely below. “There were people hanging out their windows, jumping out their windows. It was just chaotic, there was nothing we could do but look at people jump for their lives,” motel guest Manuel Sanchez told a CBS News affiliate. “People were just jumping out of their windows and screaming and yelling,” a female resident identified only as Diana told KTLA. “It was terrifying,” one guest told a local NBC News affiliate. LAFD Captain Daniel Curry told KNX Radio that “the first thing” rescuers did was place ladders against the building and remove patrons from the second floor. The motel had 29 occupants in 20 units, LAFD spokesman Erik Scott told City News Service. An undated image of the building available on the map site Here.com confirms local reports that the motel is located in an industrial neighborhood and offers guests weekly and monthly rates. According to NBC, the Red Cross and a Los Angeles City Council member, Joe Buscaino, are assisting uninjured occupants displaced by the fire. 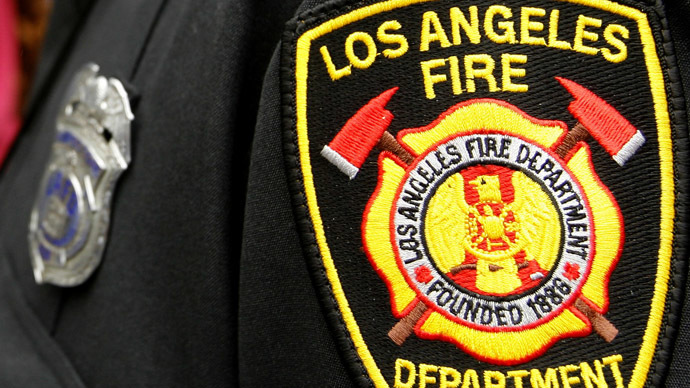 Scott, the LAFD spokesperson, said the cause of the fire is being investigated, and City News Service announced a damage estimate hadn’t been made available as of Thursday morning.